If you want a really tasty and healthy start to your day, try this Bircher muesli. My problem with it is that once I have done a batch of it, I can easily dip into it several times a day. I find it wonderfully addictive. There are worse things to be addicted to though - this is healthy stuff we’re talking about, and it’s quite filling as well. 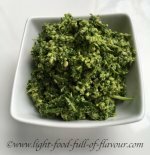 It is a great breakfast to have in the fridge if you are short of time in the morning and easy to take with you if you don’t eat before you leave to go to work. It needs an overnight soaking but all you have to do in the morning is add some yogurt and “Bob’s your uncle”. There is no one single recipe for Bircher muesli. I make it without any fresh berries or fruit as I make a big enough batch to last me for several days. I add fresh berries when I’m eating it. What I do add is a mix of seeds - sunflower seeds, pumpkin seeds, whole unhulled sesame seeds, chia seeds - and nuts, such as Brazil nuts, walnuts, almonds and pistachio nuts. Seeds and nuts are really healthy – containing lots of vitamins and minerals as well as being good sources of protein. Seeds and walnuts are also rich in the polyunsaturated essential fats Omega 3 and Omega 6. These types of healthy fats are absolutely vital for our health - vital for both our bodies and our brains - and a lot of people are deficient in Omega 3 and Omega 6. I used to add a bit of dried fruit but the sugar content in dried fruit is incredibly concentrated so I stopped adding it. I add ground cinnamon instead. Please note that if you eat cinnamon on a daily basis then it is important to eat the right kind, Click on Cinnamon Spice for more information. Fruit juice also has a high concentration of sugar but out of all juices, apple juice is the best. I use cloudy 100% pure apple juice for my bircher muesli. You might think that I am picky but I also buy organic oats. Oats contain gluten but not "gliadin", which is a specific sub-set of gluten and what causes allergic reactions. Some people with gluten intolerance can eat oats, as long as they are organic - most non-organic commercial oats are processed in facilities that also process wheat. 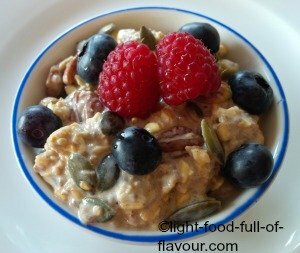 The tastiest oats I have used for both this muesli and porridge are organic wholegrain, rolled jumbo oats. 1. Mix all the ingredients together in a bowl. Cover the bowl and leave in the refrigerator overnight. 2. The next morning, add 100ml natural yogurt (I use Greek-style yogurt) to the muesli and mix well. Any left-overs will easily keep in the fridge for 3-4 days. Adding fresh berries to each portion will make this really nutritious. Fresh berries have the lowest sugar content of all fruit and are full of healthy antioxidants. Or you can add some grated or chopped apples to each portion.